HOUNSFIELD HISTORY.NET : : FAWDREY HOME, Corner of Salt Point Rd. & Fawdrey Rd. Corner of Salt Point Rd. 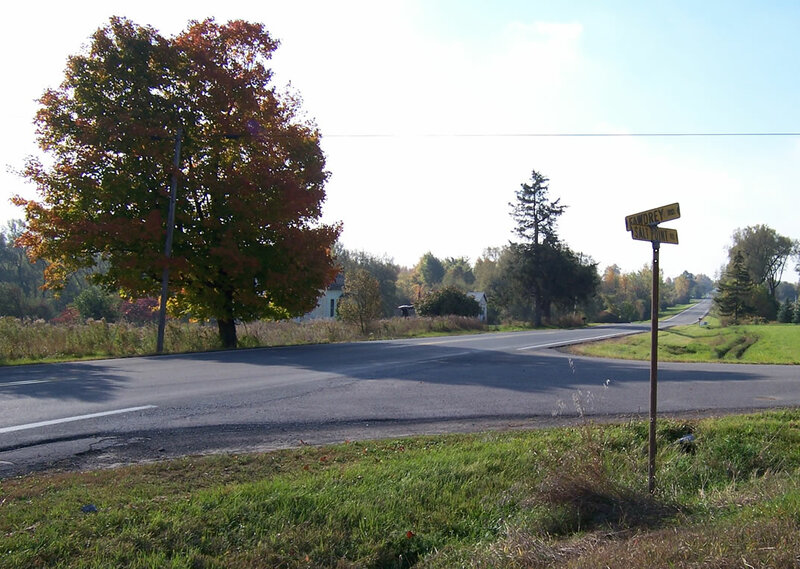 & Fawdrey Rd., Town of Hounsfield, Jefferson County, N.Y. The Daniel Fawdrey home, circa 1950, when occupied by Fred Fawdrey and his wife Reta Mae Stokes. Standing from left to right are: Fred Fawdrey, Leon Washburn, Donald T. Jenkins, Beulah (Washburn) Jenkins, Jeannie Fawdrey (dau. 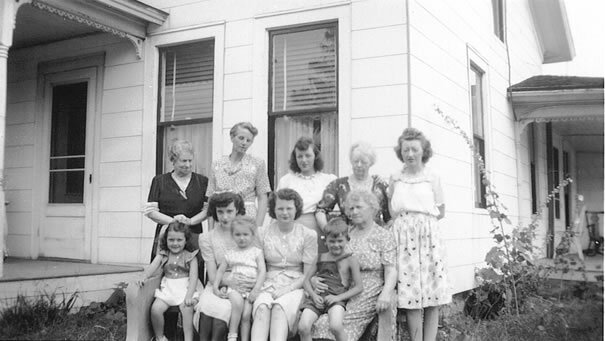 of Pauline & Gordon), Annie Zimmerman (in back), Pauline (Maxon) Fawdrey (wife of Gordon), Reta Mae (Stokes) Fawdrey wife of Fred, Ada (Stokes) Washburn Reta's sister, Margery Reta (Washburn) Gordinier, Elmo Fee, William W. Washburn. Seated from left to right are: Gordon Fawdrey (son of Fred & Reta), Leon Gordinier (son of Margery & Donald), Donald Gordinier, and Marilyn "Mickey" Gordinier. An 1864 map showing location of the home of "D. Fawdry". 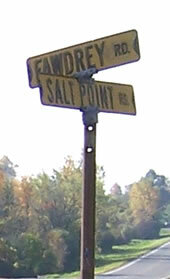 The vertical road on which the home is situated is the Old Salt Point Road, and the perpendicular road is the Fawdrey Rd. 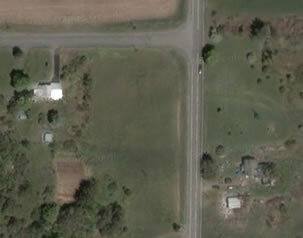 Note the George Harris home, just due west of the intersection, is still standing, as seen in the aerial view at right. Daniel Fawdrey was born 1810 at Downhill Farm, in Hailey, Oxfordshire, England, according to the research of Bob Ward, descendant. In 1833 he married Susanna Fox (a.k.a. Faulks), born about 1811 in Cambridge, Oxfordshire, England. In 1834, Daniel and Susanna left England from London aboard the steamer Montreal. They arrived at New York and eventually settled in the Town of Hounsfield, Jefferson Co., New York, in the neighborhood known as Camps Mills. It is not clear from available sources whether Daniel built or purchased his home on Salt Point Road. It is also not clear what year the structure was erected, though it appears on maps as early as 1855. The road adjacent to the property eventually took on the name of the family and is still known today as the "Fawdrey Road." Daniel died 5 January 1880, aged 69 years. Susanna died 1 December 1880. Both are buried in Sulpher Springs Cemetery. Henry, born June 1835, died 1913; married Sarah Cady. Henry was educated at Union Academy of Belleville and Union College. He engaged in teaching and was then in the commission business at Albany for about thirty years. 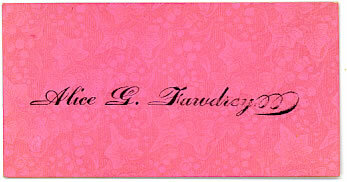 In 1894 he returned to Sacket Harbor and located on the old homestead, where he retired. He was a very prominent Mason in the city of Albany, and also a member of K. of P.
Alice G., born 10 March 1864, died 23 February 1928; married Daniel E. Fitzgerald. Ida May, born May 1870; married Edward Cobb. Walter, born about 1867, and died 1915; married Alice M. Harris. David, a physician, born 1838, died 13 February 1906 at Watertown; married Adelaide Hazelton, and resided in Barnes Corners, Jefferson Co., New York. Elizabeth, born 1839, died 1904; married Jackson Squires, resided in Adams, Jefferson Co., New York. Fred Fawdrey, born 17 March 1877 in Hounsfield, died 2 June 1966; married 18 January 1899, Reta Mae Stokes, daughter of John L. Stokes and Lydia Kennedy. and sister of Ada Mae (Stokes) Washburn. 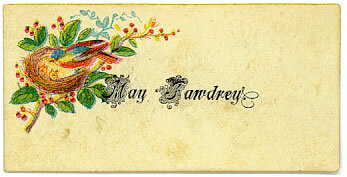 Mary Ann, born April 1846, died 1914; married Leon Sheldon Sackett, resided in Adams, Jefferson Co., New York. Caroline, born 1815, died 1913; married in 1874 Walter B. Kenyon. Gathering at the Fawdrey Home, circa 1945. From left to right in the back row are: Annie Zimmerman, cousin of Reta (Stokes) Fawdrey, Pauline (Maxon) Fawdrey, Beulah Washburn, daughter of Ada (Stokes), Ada (Stokes) Washburn, sister of Reta Mae, Margery (Washburn) Gordinier, daughter of Ada (Stokes). 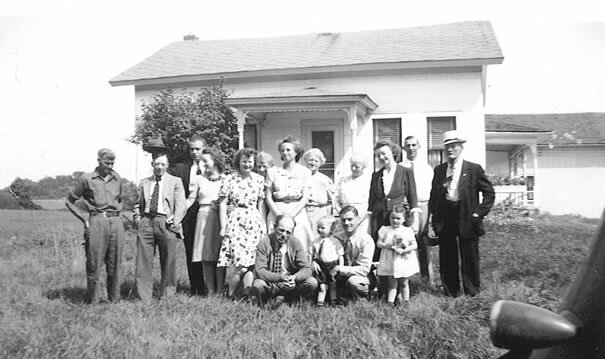 From left to right in the front row are: Marilyn "Mickey" Gordinier, Dottie Fawdrey, unidientified girl, Jeannie Fawdrey, Skipper (adopted son of Pauline & Gordon Fawdrey) and Reta May Stokes, wife of Fred Fawdrey. View of the Fawdrey home, as seen from the northwestern corner of the intersection of Fawdrey Road and old Salt Point Road, October 2006. 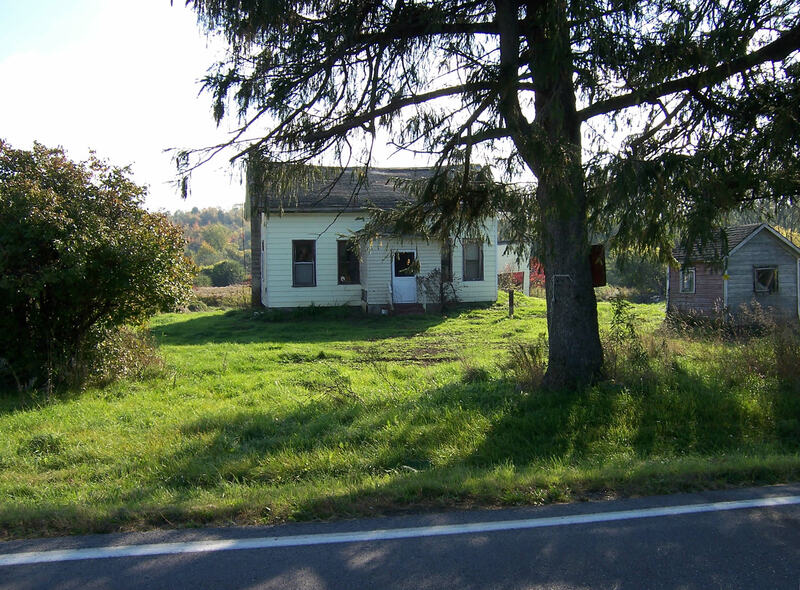 As of October 2006, the home appears to no longer be occupied and has fallen into disrepair. Current and archival photos, and calling card images, from the personal collection of Mark Wentling. Ward, Bob. German Bob's Ancestral Home Page. http://familytreemaker. genealogy.com/users/w/a/r/Robert-E-Ward/index.html. [Visited on 22 October 2006]. hounsfield/cards/callingcards.html. [Visited 22 October 2006]. 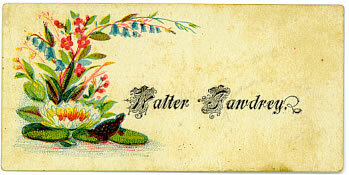 PIONEER FAWDREY FAMILY. Contributed by Bob Ward. Jefferson County, NY GenWeb. Online at http://jefferson.nygenweb.net/ressep.htm. [Visited on 22October 2006]. or at hounsfieldhistory.net under "Neighborhoods" or "Homesteads"
© 2006, Mark A. Wentling : : You are the 7822nd visitor!